Touted as a “healthy” and “natural” alternative to cow’s milk, soy milk has become a health food darling the last few decades. The big problem: soy milk isn’t even close to being natural and certainly isn’t healthy. Three main reasons underlie this statement: soy itself, the production process and the additives blended into the milk. As some of you already know, I don’t consider soy a healthy food as it’s commonly consumed. Once only used as a filler crop to restore nitrogen balance in the soil, soy is now used in some cultures (mostly Asian) in small amounts, traditionally prepared (fermented) and eaten with balancing foods (fish and sea vegetables). From good seeds and eaten this way, soy is likely not too bad. Soy, the way we know it (from bad seeds, processed down to the last molecule and consumed in huge isolated amounts) is likely very problematic. Many health practitioners can and have been making strong arguments against soy, identifying enzymes, lectins, estrogen mimicking and thyroid disrupting properties of soy and the associated health effects. I agree that these all have some merit and should be taken into serious consideration (for more, you can check out my Avoid Soy page). When I hear of monks using soybeans to manage their libido during celibacy, a large, bright, waving red flag goes up quickly. The bigger red flag: soy is a product of big agriculture (where politics, money and power trump everything else, particularly health), 90% of it is from genetically modified seeds (with Round Up resistance built in) and it is processed, separated and consumed in ways and amounts unlike ever experienced or even imagined in human history. Whether in the form of soybean oil (a whole other can of worms), soy protein isolate, soy flour, soy lecithin or soy milk, humans are now consuming an unhealthy food in unhealthy forms and unhealthy proportions. Quite the journey, with all the heat, smashing and sorting out that goes on, but unfortunately there’s more. Let’s take a closer look at those additives that were blended in. Since soy milk is almost tasteless and void of nutrients, something is needed to make it palatable and fortifying is added to make it “nutritious”. A typical soy milk contains water, soybeans and additives of: sugar (cane sweetener of some kind), Vitamin A Palmitate, Vitamin D2 (many questions about this form of D), Riboflavin (B2), Vitamin B12, calcium (usually carbonate, what chalk is made of), salt, carrageenan (many concerns here), and others depending upon the brand or flavor (xanthan gum and “natural flavors” are two more common ones). In general, too much “stuff” for my comfort level. Any additives, particularly in the form of vitamins, minerals and preservatives gives me concern. Any time a food needs to be “fortified” or “enriched” (i.e. bread, cereal, pasta etc.) it means it wasn’t much of a food in the first place. Real food doesn’t need to be fortified. It already has all the right things in it. In general, if someone is looking for a milk product, soy milk would be the last choice, where good organic dairy is likely a much better choice. 1. Soy is a questionable food in general. 2. 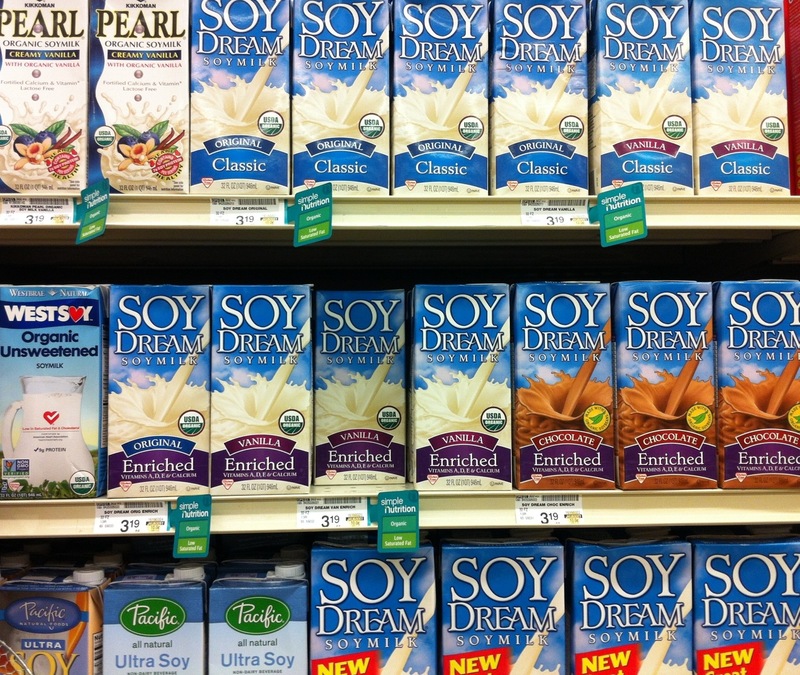 Soy milk is an extremely processed food product. 3. The additives in soy milk are not health promoting. 4. Soy milk, in it’s common form, is a brand new food for humans. 5. There is no need for soy milk in the diet of most humans and likely is doing more harm than good. Go with regular milk or skip milk all together.